This study investigated the antibacterial and synergistic efficacy of acetone extracts of seed of Buchholzia coriacea (wonderful kola) and Garcinia kola (bitter kola). Extraction was carried out using acetone, and Agar well diffusion sensitivity testing method was adopted. Results showed that the highest zone of inhibition was achieved when both kola was mixed at ratio of 1:1. 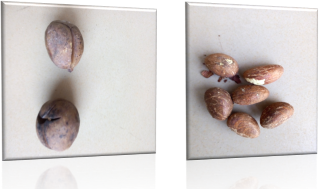 The zone of inhibition of synergy extract of Garcinia kola nut and Buchholzia coriacea seed for E. coli, Pseudomonas sp, Staphylococcus aureus and Bacillus sp were 14.00 mm, 12.33 mm, 13.0 mm and 12.00 mm respectively. Furthermore, individual zones of inhibition for E. coli, Pseudomonas sp., Staphylococcus aureus and Bacillus sp. were 11.33 mm, 9.67 mm, 13.67 mm and 11.00 mm respectively for Buchholzia coriacea and 13.00 mm, 11.00 mm, 13.0 mm and 12.67 mm respectively for Garcinia kola. Analysis of variance showed that there was no significant difference (p > 0.05) among the different isolate for the different extracts except for that of Buchholzia coriacea. This study showed that synergistic efficacy of bitter kola and wonderful kola produced superior antimicrobial effects. Again, the positive result for both gram negative bacteria (E. coli, Pseudomonas sp.) and gram positive bacteria (Staphylococcus aureus and Bacillus sp.) suggest that they could be used as broad spectrum antibiotics.